I thought I took a picture of the final product but I must not have saved it. 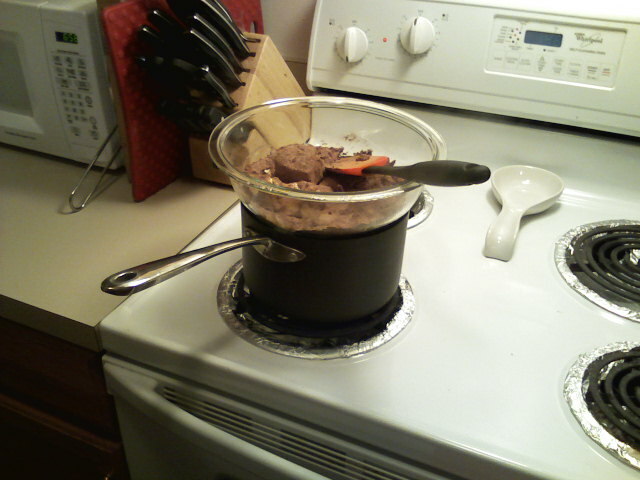 Regardless observe the poor man's double boiler. These brownies were terrific. The first bite made me a little skeptical and the batter was not as sweet as boxed brownies but they grew on me fast. Comments from my taster friends were that they had the perfect chewy texture that most homemade brownies lack. While everyone liked them they didn't beat out Ghiradelli boxed brownies because they have more of a dark chocolate taste from the cocoa. I give them four stars.